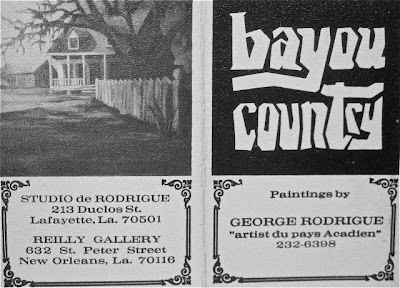 From day one, from his return to Louisiana from art school in Los Angeles in the late 1960s, George Rodrigue wanted one thing: to make a living as an artist. He knocked on doors for months with hopes of representation and finally gave up, placing an ad in the back of Southern Living Magazine and Acadiana Profile, using his home address and phone number. 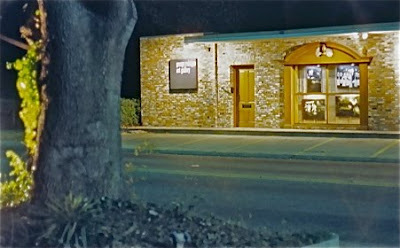 To his surprise the response to the tiny black-and-white advertisement was immediate. Yet people were shocked to find a young man in his twenties behind these seemingly antique works. “Son, is your daddy home?" 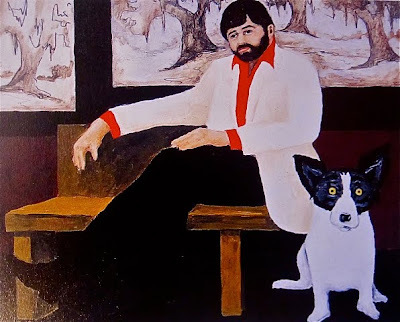 As long as he can remember, George Rodrigue fought to be taken seriously as an artist. 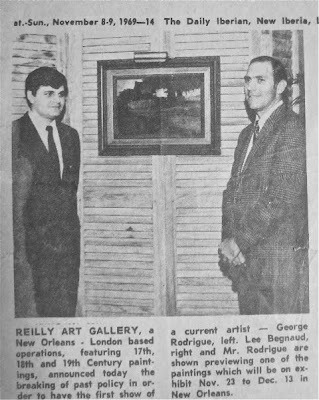 Within a year after his return from art school in 1967 he supported his family with his original ideas on canvas, bringing in $100 a month at first, with sales of two to three paintings from the front door of his house. 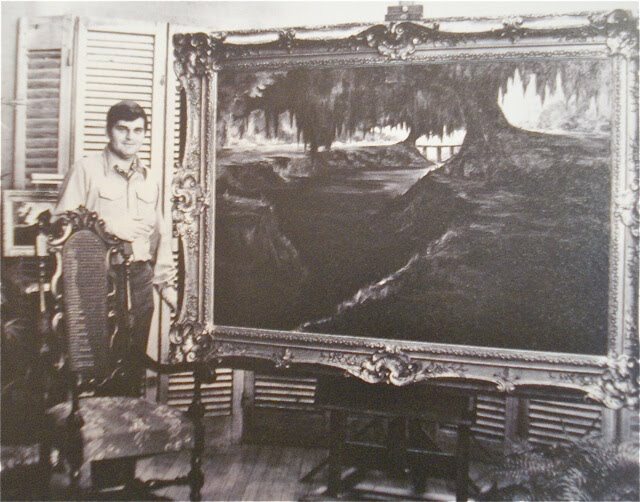 He raised his prices, selling canvases for $3000 to $5000 from his makeshift gallery, the trunk of a bumped-up Lincoln Mark V, because still, despite hundreds of paintings, successful sales, and five years after his return from a prestigious art school, no agent wanted him, and no gallery carried his paintings. From there he moved to Jefferson Street, raising his house and building a gallery underneath, abandoning any hope of outside representation for his work. 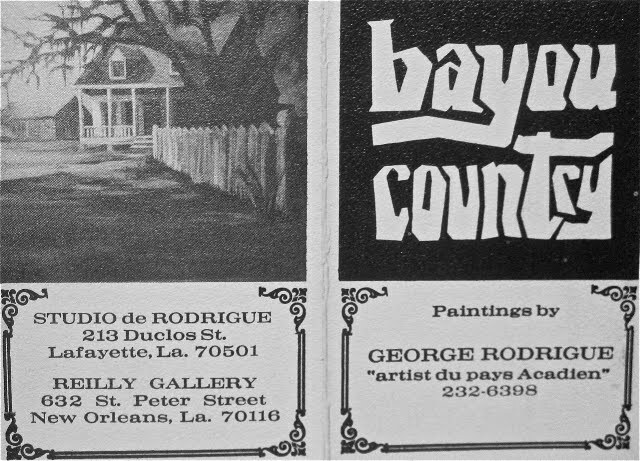 This is where George’s sons grew up, where his dog Tiffany lived, where he painted hundreds of paintings of Cajun folk life, and where most of his Cajun painting fans (unless they ran into him on the road) came to know his work. At last, in 1989, things changed. A local doctor and his brother, a wanna-be agent, opened a gallery at 721 Royal Street in the French Quarter spotlighting the art of George Rodrigue. 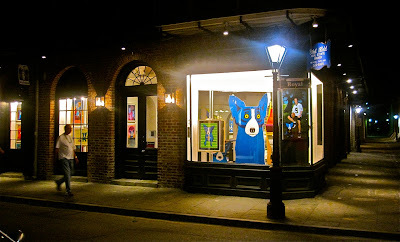 For nine years this agent managed George’s career from a rented space and called it The Rodrigue Gallery of New Orleans (pictured below, May 2, 2010). 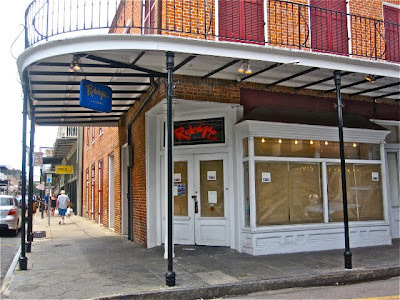 Even after George bought him out in 1998, we continued selling the Blue Dog and Cajun paintings from this rented location, a small square room badly in need of repairs and an updated design. Comfortable as his own agent and now routinely declining outside representation, George still hoped for a gallery of his own. In charge of his career once again, the change was immediate. George painted to please himself, as opposed to an audience or agent. 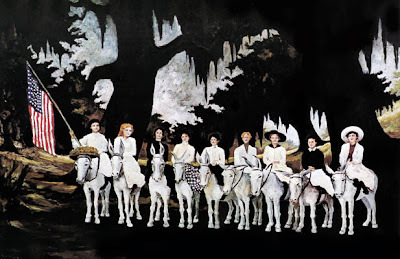 When he did paint for others, it was exciting projects of his choosing, such as Neiman Marcus, the Chicago Cow Parade, and Xerox. This self-representation worked in his favor. He pondered both in his head and on his canvas questions of ‘style’ and ‘meaning,’* with relief and without fear of criticism. 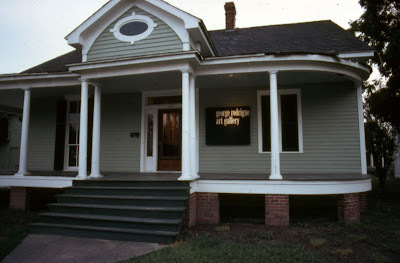 And yet he still wanted a gallery of his own, something unrented, available for his renovations and, in the end, reflective of his contemporary vision. So did I: a woman, a wife, an insecure accomplice writing about her man, her husband, the breadwinner, the confident and great artist, her supportive and occasionally convincing ‘I-wouldn’t-be-where-I-am-without-you’ partner in life. 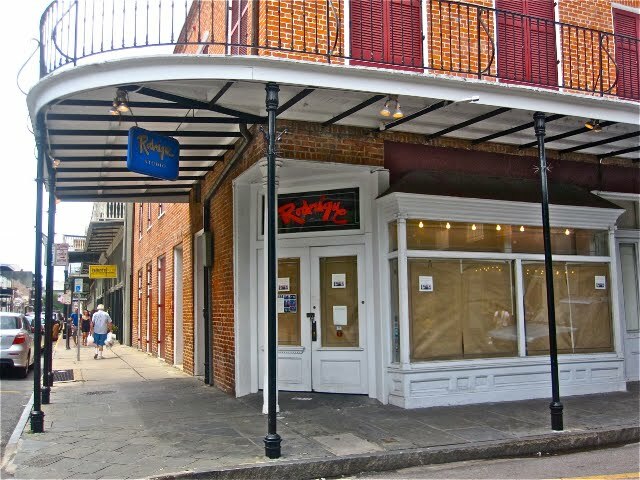 And so in 2009 we bought a building, a two hundred year-old brick structure across from our old rental space and adjacent to St. Louis Cathedral at 730 Royal Street in the New Orleans French Quarter. George and his son Jacques spent nine months on renovations, and in April 2010 George Rodrigue opened a gallery of his own. “You are doing something far more important with your blog. You’re setting the story straight. You are my archivist. That’s where I need you." It is because of George that I keep writing…not because I must exaggerate his story, and not even because I must tell his story (in fact there are many who could relay far better, and with any luck this blog will attract just such a biographer), nor because his ego requires it, but rather because he believes in me, because he encourages this blog of my own. So do you get it? Have you figured out my deception in this story? My thievery? My homage? The echo, albeit weakly interpreted, of a brilliant essay? 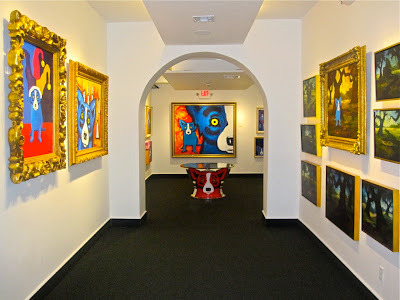 George Rodrigue has a gallery of his own, just one block from the Reilly Gallery, the location of his first show, and the only gallery that ever took a chance on him, now forty years ago. For a virtual tour of the new Rodrigue Studio, visit here. I am a huge fan of your husband's work. Huge fan! Although, I do not own any originals or original prints, I visited that gallery you spoke of often. I also have his books and several framed postcards. I appreciate you writing about his background and history of his work. But I appreciate you writing about yourself and how you feel. So many people would not do that for fear of the consequences. I applaud you for doing this and I think it is great that George supports you. That means you truely have a great partner and he believes in you just as much as you believe in him. That is so important these days and you don't see that in many couples. I am part of that fortunate club too. I have a very supportive husband. I have a hard time putting into words how I feel about him and your blog gives me inspiration. Keep writing, keep sharing, and keep believing. Wendy, my dear, don't ever sell yourself short. As I've said many times, it is YOUR voice that brings your words to life, not the words which brings your voice to life. While the subject may be George's work and life, it is your voice which tells the story so beautifully, honestly, and faithfully. I think, VW would agree (so I quote from her A ROOM OF ONE'S OWN): "Masterpieces are not single and solitary births; they are the outcome of many years of thinking in common, of thinking by the body of the people, so that the experience of the mass is behind the single voice." Believe in that single voice of yours! We do. So many artists know this kind of life and experiences, thanks for sharing. It's such a joy seeing someone so dedicated to art. 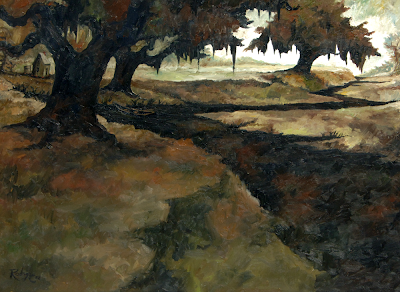 Thanks for sharing your ideas and inspiring other art lovers. Your engaging writing style adds to the appeal of George's art. My husband and I are longtime Blue Dog fans, along with our (now) adult children and grandchildren. Our granddaughter began pointing to "Washington Blue Dog", in our living room, before she started taking steps. Now her favorite book stack includes "Why is Blue Dog Blue?". I enjoy your blog and I'm glad to have the chance to thank you for sharing a special part of your life. Please keep doing what you're doing! I have a print and have ordered the framed postcards for my home. 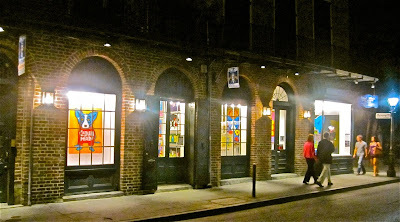 Great post and so nice to hear the story behind a gallery I have visited...these paintings are well known to all visitors to New Orleans! Thank you, Melanie! Looking forward to meeting 'Miss Thang' at the Emily P. Robinson Community Center in Monroe for Sidewalk Chalk with George! Thank you for reading! Wendy, believe me, I am not one to read blogs. But as I read yours I am completely hooked. The mixture of photos and art keep me engaged. And then, as I stuck to it and finished this page, I saw more deeply your gift as a writer and your creativity. Your thumbprint and heart are in these pages. You have found a medium of expression that works for you and is attractive and helpful to others. Creativity is creativity. For some reason I think of Frieda Kahlo and you having a kindred spirit. As I delve into this blog more in coming days and weeks, I know that I too will be inspired. I am a poet, among other things, and look forward to that inspiration. Thanks for your fine work on this blog. Finally, I want to say that I enjoyed your expression of your relationship with George. It reminded me of my own relationship with my beautiful wife and the depth and breath of sharing that we have. 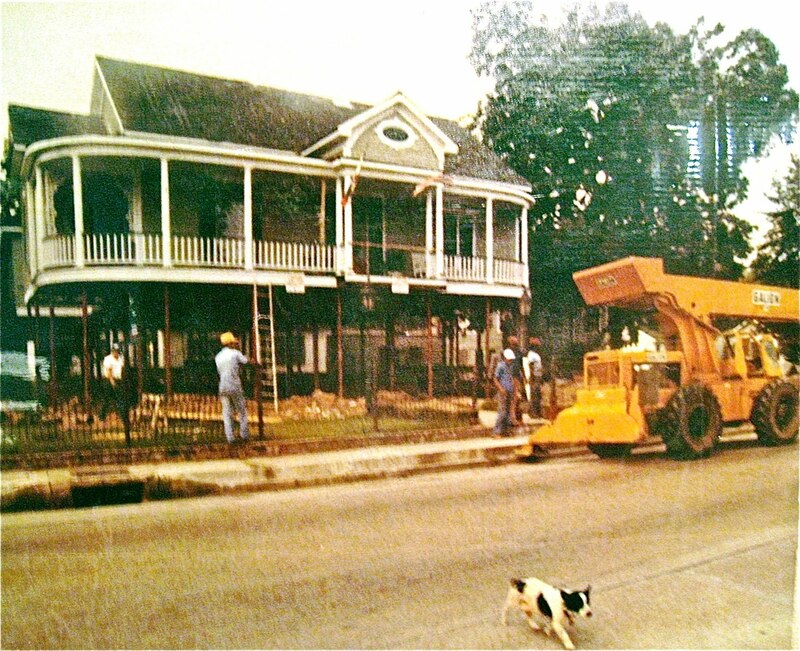 It is always a work in progress - kind of like George's career and your work as a blogger. I enjoy your blog. No one should ever forfeit having children of their own, though. I don't know anyone who has done so and not regretted it when they were older. Love & Peace to you and yours. If it was not for Johanna Van Gogh wife of Theodore as she took on the task of introduce Vincent paintings to the world. we may never really know him as he is today. Keep up the good work of writing about your husband.